Have an inverter question? Here is a list of the most common inverter questions that we get asked. How long will my batteries last? Each time I run my inverter a high pitched alarm is sounding? This is the most often asked question regarding power inverters, and is the most difficult to answer. The length of time that your batteries will last is proportionate to the size of the battery, the load of your inverter, what other loads are running from the battery and what charging sources are connected. Without knowing all of these factors no one can give a precise answer. What we can however do is look at the power requirements of the appliances you need to run, how long do you intend to run them and what other DC appliances are going to use the batteries. The high pitched alarm being experience can come from two problems: Insufficient battery cables creating voltage drop, or, a depleting battery capacity. If the alarm keeps going off, even when your batteries are fully charged, have someone look at your battery cable set up for undersized cables, or loose connections powering the inverter. How much power will my inverter draw? I left my inverter on all night and now nothing works? The power required to run an inverter is approximately 8-10% more than the power load of the appliances being run. This is due to the efficiency of the inverter. These days, quality inverters are between 90-92% efficient. 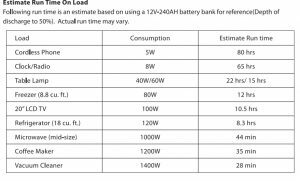 An easy formula to use to work out how much DC Amps you will use from your battery is, simply divide the AC wattage of your appliance by 12 (or 24 if a 24v system) and times this number by 1.1 to get a very close estimate of the DC draw. Inverters will draw power from your batteries when not in use, and the unit is turned on. This can vary from around .02 amps right up to 2amps depending on the unit and design of their standby systems If you leave your inverter turned on with no load attached, the average draw from your batteries will be 1 amp per hour; 24amps per day; or 168 amps over a week. The simplest solution to this is to just turn the inverter off when not required as the battery drain then becomes zero. Many of our inverters feature standard or optional remote on/off controls. The simple method of working this out, is to find the largest constant AC load you plan to run from your inverter (in most cases a microwave is the largest appliance), and divide this wattage x 5 (20% of your load). This will give you a rough idea of how much battery capacity you require to sustain your loads. With the example above, the microwave draws around 1000 watts AC, so a battery bank of around 200amp hours would be required. Sizing your inverter is a difficult task, and is not made any easier by different brands and manufacturers rating the power of their units at different temperature ratings. The power output of an inverter is dramatically decreased as its internal temperature rises, this is sometimes called its 5, 10 & 30 minute rating; but in reality if the inverter cannot remove the heat quick enough, then the output power will rapidly drop off. Many of the inverter brands on the market are rated to supply full output power up to 25°C and start to de-rate the output power from this point on. Some industrial models with supply full output upto a staggering 40°C. Basically, add up all of the AC loads you want to run, then determine if you want to run all of these items at the same time. If not, choose the largest load in the system and size the inverter 50% more to cover peak surge loads. What happens if someone plugs an appliance in that they shouldn’t have? The great advantage of the power inverter is its ability to surge to power output levels well in excess of its normal continuous ratings. These levels are generally twice the normal output power for 1-2 seconds to allow for starting of larger, or inductive type loads. If the load is too large for the power output (e.g someone connects a hair dryer to a 500watt inverter), then the inverter simply shuts the power down. Depending on the inverter, an audible alarm will sound, or the inverter will simply restart to try the load again. Always keep in your mind that a power inverter has limitations, mainly its power size. What inverter/size do I need to run my C-pap (respirator) machine? For C-pap machines to function correctly they require a pure sine wave power output. 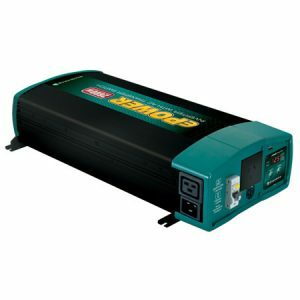 These machines tend to draw around 200watts, which equates to 18amps per hour. For a normal night of sleep (7-8 hours), you would need a battery bank of around 200amp hours (and a suitable recharging system). The ePOWER 400watt inverter is perfect for basic C-pap machines, contact us for details if your machine has a heater inbuilt. My inverter is running very hot, is this alright? Power generation creates heat, so yes your inverter will get warm. For this reason it is important to keep your inverter in a location that is cool and dry, and installed in an orientation that will help assist with ventilation (e.g. you are not blocking the intake vents or fans with clothes or tools). If your inverter gets too warm, it will simply shut down until the unit cools down. As mentioned above, the hotter your inverter gets, the less AC power it will deliver (hence the new designs such as Prosine that allow for rapid removal of warm air from the inside workings). When using my television off the inverter, there are a number of fuzzy lines across the screen. Again a result of using a modified sine wave inverter. Many appliances react to this type of waveform (such as televisions generating lines across the screen, or radios having a hum through the speakers). There is not a great deal you can do to stop this except to upgrade pure sine wave inverter. Try twisting the battery cables together and then wrap them in alfoil, as well as moving the inverter as far away from the interfered appliance as possible (these are merely suggestions and may not work in every case). Can I run my computer / laptop from an inverter? The answer to this is very much the same as the Televisions above. Modified sine wave inverters can be used on either a computer or laptop, however if the laptop is to only ever be powered from the inverter then a pure sine wave inverter (such as the ePOWER or ePRO) should be used, as the modified sine wave inverters will actually destroy the laptop battery pack. My electrician will not install my inverter because there is no earth from the 240 volts AC output. Will my RCD’s work, and can the inverter be installed safely?